Yesterday I went to a memorial for a friend who lived here in Lordsburg. He passed away Sunday, and his friends gathered at the airport to celebrate his life. He and his wife ran the local airport, and it seemed like the most appropriate place to see him off. How many of us on our final journey get to go from an airport... Well that was John. In his memorial it was said that he liked driving fast things. He flew planes, rode motorcycles and jet skis, fast cars, he built and drove a race car for the races in Las Cruces, and that only what I know about. For all I know there was a rocket somewhere in there. He lived life fast! That was one thing that was generally known about John, but there was more that I thought better defined the man. In all of the memorial remembrances it seemed that everyone agreed that he was a thoughtful and kind man. He was well thought of, and that was evident in the number of people that showed up to the memorial. What could be said or thought of a person that could be a better memorial than that! People will remember John fondly. John crammed life into every minute of what time he had, and experienced life to it's fullest. 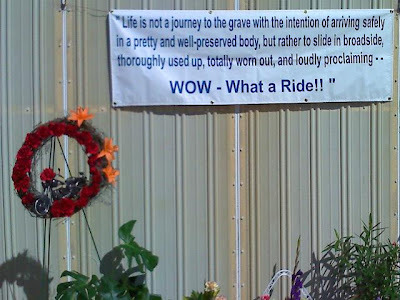 He lived the saying that was displayed in his workshop shown in the photo above. In a Jimmy Buffett song there is another phrase that I felt was true of him, "I'd rather die while I'm living than live while I'm dead," and John did. We should all do so well.